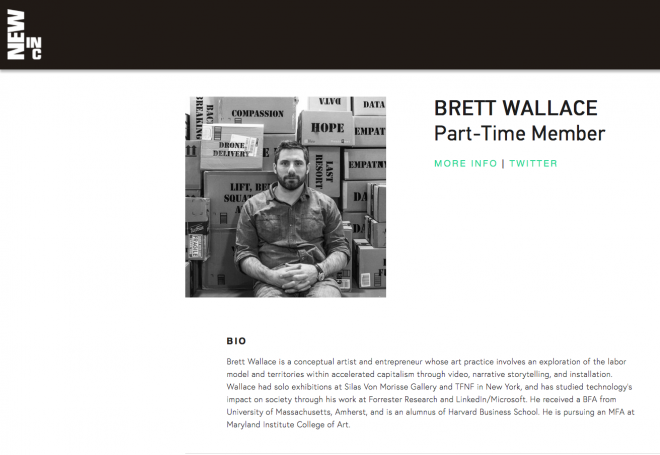 Brett Wallace is a conceptual artist and entrepreneur whose art practice involves an exploration of the labor model and territories within accelerated capitalism through video, narrative storytelling, and installation. Wallace had solo exhibitions at Silas Von Morisse Gallery and TFNF in New York, and has studied technology’s impact on society through his work at Forrester Research and LinkedIn/Microsoft. He received a BFA from University of Massachusetts, Amherst, and is an alumnus of Harvard Business School. He is pursuing an MFA at Maryland Institute College of Art.